First on the list is a box of crayons. I have given a box of crayons as part of an artful gift. I pair the crayons with some great coloring books and books and wrap nicely. And owning a box of crayons teaches children so much about decision making and choices. If your child is coloring an animal, he or she has to decide what color will the animal be. What color will the eyes of this animal be? Your child has to decide if he or she will add colors and drawings that are not on the picture. ...like adding clouds to a cloudless picture. Crayons teach without ever saying a word. And after all that decision making, your child gets to sit back and enjoy all his or her labor that went into making that picture pretty. The next art supply for your artful home is Black Sharpies . Black Sharpie's are the business. really. You can take a black sharpie and create your own coloring books for your child. You can use a black Sharpie to write out sentences, words or pictures. Every artful home should have a few Black Sharpie's. And lastly, a ream of white paper . If you have a printer at home, printing paper can be used for creating art as well as creating reading books. This is a very basic beginning to building a Home art supply arsenal. 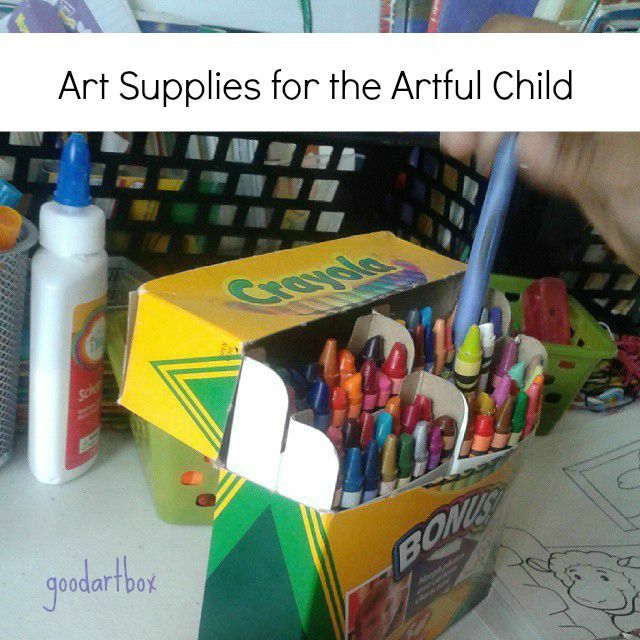 What other art supplies do you keep on hand?